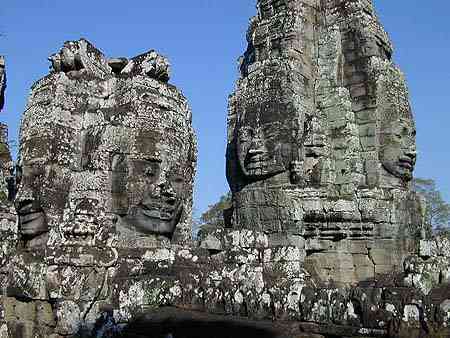 "The Bayon Temple is smaller than Angkor Wat. Its area is not big, modest 600�600 meter. From a distance, it does not impress, and looks more like a shapeless heap of stones. Only on coming closer, when the faces on the numerous towers begin to appear clearly, one understands how wrong was his first impression. I am not an archaeologist, just fan of archaeology, but the Bayon Temple seems to me only �the tip of the iceberg.� Partially excavated galleries around the perimeter of the temple lie below ground level. How deep the foundation is, archaeologists don�t know. Deep underground, they found tightly walled rooms in which the same smiling faces were hidden in the dark. 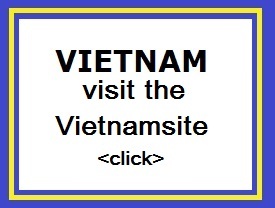 Tourists are not allowed to visit them, because the risk of collapse is very high." 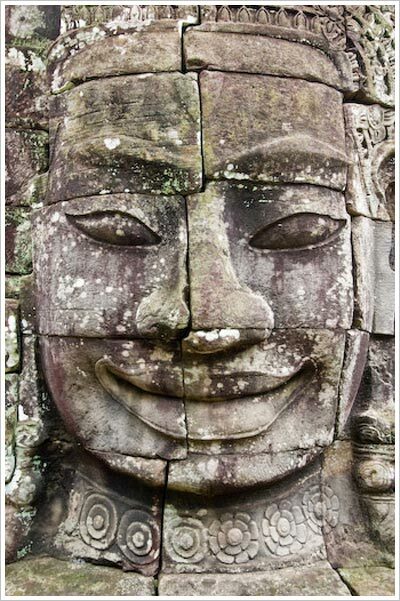 The Bayon, is located at the physical center of Angkor Thom, the nine square kilometer or (three and a half square) mile city complex, and is the focal point of the building boom Jayavarman VII initiated after he defeated the Chams to reclaim the Khmer Empire. The temple is a Mahayana Buddhist temple; its primary deity is Avalokitshvara, the bodhisattva of compassion. Since this temple sits in the center of Angkor Thom, his state capital, this monument makes the entire capital a temple complex, with the walls of the city and the moat representing the outer mountain ranges and oceans of the mythical Hindu universe. 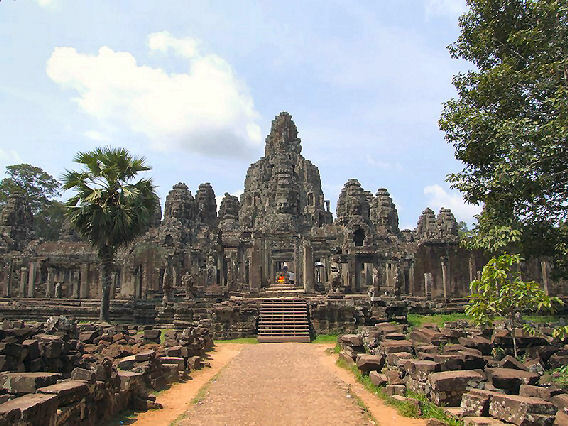 The architectural composition of the Bayon exudes grandness in every aspect. Over 200 large faces carved in the 54 towers give this temple its majestic character, which at that time represents the 54 provinces in debated by scholars and some think they represent the Bodhisattva Avalokiteshvara, in keeping with the Buddhist character of the temple, it is generally accepted that the four faces on each o the towers are images of King Jayavarman VII and signify the omnipresence of the King. The plan of the Bayon is presented on three separate levels and its height is 43 m. It stayed for a long time an enigma. The first and second are a pantheon dedicated to the gods Khmers of the beginning of its construction, in a time of transition between the Hinduism and the Buddhism. The superior floor is dedicated to Buddha. Fabulous low reliefs of 1200m of length and representing more than 11000 sculptured persons, very long frescoes telling the fights and the naval battles between the Khmers and the Chams, as well as the daily life. Despite this seemingly simple plan, the layout of the Bayon is complex due to later addition, a maze of galleries, passage and steps, connected in a way that makes the levels practically indistinguishable and creates dim lighting, narrow walkways and ceiling.